Do not adjust the audio control switches while driving the vehicle. • To prevent the battery from being discharged, do not leave the audio system on for a long period of time when the engine is not running. • If a cellular phone or CB radio is used in or near the vehicle, it could cause noise to occur from the audio system, however, this does not indicate that the system has been damaged. • The CD revolves at high speed within the unit. Defective (cracked or badly bent) CDs should never be used. • Do not use non-conventional discs such as heart-shaped, octagonal discs, etc. The disc may not eject resulting in a malfunction. • If the memory portion of the CD is transparent or translucent, do not use the disc. • A new CD may have rough edges on its inner and outer perimeters. If a disc with rough edges is used, proper setting will not be possible and the CD player will not play the CD. In addition, the disc may not eject resulting in a malfunction. Remove the rough edges in advance by using a ballpoint pen or pencil as shown below. To remove the rough edges, rub the side of the pen or pencil against the inner and outer perimeter of the CD. • When driving over uneven surfaces, the sound may jump. • The CD player has been designed to play CDs bearing the identification logo as shown below. No other discs can be played. • Use discs that have been legitimately produced. If illegally-copied discs such as pirated discs are used, the system may not operate properly. • Be sure never to touch the signal surface when handling the CDs. Pick up a CD by grasping the outer edge or the edge of the hole and the outer edge. • Do not stick paper or tape on the CD. • Dust, finger smudges, and dirt can decrease the amount of light reflected from the signal surface, thus affecting sound quality. If the CD should become soiled, gently wipe it with a soft cloth from the center of the CD to the edge. • Do not use record sprays, antistatic agents, or household spray cleaners. • Insert discs one by one. If two discs are inserted at the same time, the system may not operate properly. • The CD player ejects the CD if the CD is inserted upside down. Also dirty and/or defective CDs may be ejected. • Do not insert cleaning discs in the CD player. • Do not insert any disc with a peel-off seal affixed to it. • This unit may not be able to play certain CD-R/CD-RWs made using a computer or music CD recorder due to disc characteristics, scratches, smudges, dirt, etc., or due to dust or condensation on the lens inside the unit. • Storing CDs in the vehicle exposed to direct sunlight or high temperature may damage the CD-R/CD-RWs, and make them unplayable. • CD-R/CD-RWexceeding 700 MB cannot be played. • This unit may not be able to play certain discs made using a computer due to the application (writing software) setting used. (For details, consult the store where the application was purchased.) • It is possible that certain text data, such as titles, recorded on a CD-R/CD-RW may not be displayed when musical data (CD-DA) is playing. • The period from when a CD-RWis inserted to when it begins playing is longer than a normal CD or CD-R.
• Completely read the instruction manual and cautions for CD-R/CD-RWs. • Do not use discs with cellophane tape adhering, partially peeled off labels, or adhesive material exuding from the edges of the CD label. Also, do not use discs with a commercially-available CD-R label affixed. The disc may not eject resulting in a malfunction. Supply of this product only conveys a license for private, non-commercial use and does not convey a license nor imply any right to use this product in any commercial (i.e. revenuegenerating) real time broadcasting (terrestrial, satellite, cable and/or any other media), broadcasting/streaming via the Internet, intranets and/or other networks or in other electronic content distribution systems, such as pay-audio or audio-on-demand applications. • ISO 9660 level 1 • ISO 9660 level 2 • Joliet extended format • Romeo extended format • This unit handles MP3 files conforming to the MP3 format containing both header frames and data frames. • This unit can play multi-session recorded discs that have up to 50 sessions. • This unit can play MP3s with sampling frequencies of 8/11.025/12/16/22. • This unit can play MP3 files that have been recorded in bit rates of 8 kbps to 320 kbps. Nonetheless, to insure enjoyment of music with consistent sound quality, it is recommended to use discs that have been recorded at a bit rate of 128 kbps or more. • If a disc has both music data (CD-DA) and MP3 files, playback of the two file types differs depending on how the disc was recorded. • Packet written discs cannot be played on this unit. • This unit does not play CDs recorded using MP3i (MP3 interactive), MP3 PRO and RIFF MP3 formats. • File number A numerical file number is assigned to each file in a folder starting from the deepest hierarchy. 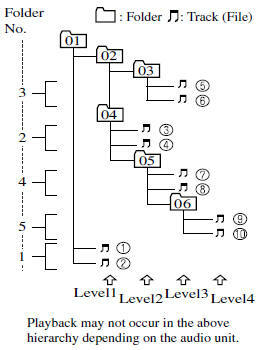 • Folder number A numerical folder number is assigned to each folder starting from the deepest hierarchy. • The folder order is automatically assigned and this order cannot be optionally set. • Any folder without an MP3 file will be ignored. (It will be skipped and the folder number will not be displayed.) • MP3 files not conforming to the MP3 format containing both header frames and data frames will be skipped and not played. • This unit will play MP3 files that have up to eight levels. However, the more levels a disc has, the longer it will take to initially start playing. It is recommended to record discs with two levels or less. • A single disc with up to 512 files can be played and a single folder with up to 255 files can be played. • When naming an MP3 file, be sure to add an MP3 file extension (.mp3) after the file name. This unit can only play MP3 files that have an MP3 file extension (.mp3) attached. Do not attach an MP3 file extension to any other type file as it could cause noise to be emitted or a malfunction in the unit. • This unit can only display ID3 Tag album, track and artist names that have been input using Ver.1.0/1.1/2.2/2.3/2.4 formats. Any other data that may have been input cannot be displayed. 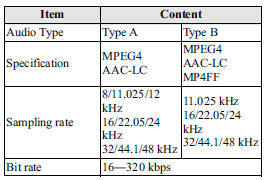 A technical standard for audio compression as decided by the ISO*1 MPEG working group. 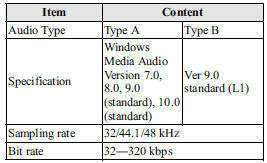 Use of MP3 allows for audio data to be compressed to approximately a tenth of the source data size. This unit plays files with the (.wma) file extension as a WMA file. Do not use the WMA file extension for files other than WMA files. Otherwise, it could result in noise or a malfunction. • Track, artist and album name information is recorded as data termed “WMA-Tag”, and this information is displayable. • WMA files written under specifications other than the indicated specification may not play normally or files or folder names may not display correctly. • The file extension may not be provided depending on the computer operating system, version, software, or settings. In this case, add the file extension “. wma” to the end of the file name, and then write it to the disc. 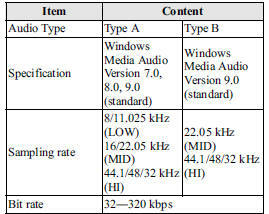 AAC stands for Advanced Audio Coding, which is standardized voice compression established by the ISO*1 working group (MPEG). 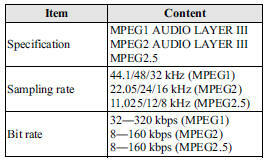 Audio data can be created and stored at a higher compression ratio than MP3. This unit supports playback of AAC files recorded in CD-R and CD-RW. This unit plays files with the file extension (m4a) as an AAC file. Do not use the AAC file extension for files other than AAC files. Otherwise, it could result in noise or a malfunction. • Song, artist, and album name information in the AAC file is recorded as data termed “iTunes, m4a, Meta- Data applicable”, and this information is displayable. • AAC files written under specifications other than the indicated specification may not play normally or files or folder names may not display correctly. m4a” to the end of the file name, then write it to the disc. This unit supports playback of MP3/ WMA/AAC files recorded to USB memory. • Music data (MP3/WMA/AAC (.m4a) format) stored in a USB mass-storage class compliant device (such as USB flash memory) can be played. • Playback may not possible depending on the type and condition of the USB flash memory even if the audio file complies with the standard above. • A copyright protected WMA/AAC file cannot be played in this unit. • The order of the music data stored in the device may differ from the playback order. • To prevent loss or damage of stored data, we recommend that you always back up your data. • If a device exceeds the maximum electric current value of 500mA, if may not operate and recharge when connected. • Insert or pull out the USB memory without accessing the USB memory (while in FM/ AM radio or CD mode). • If access to the data in the device is restricted because it is password protected, the device will no operate. This unit plays files with the file extension (mp3) as an MP3 file. Do not use the MP3 file extension for files other than MP3 files. Otherwise, it could result in noise or a malfunction. • MP3 files written under specifications other than the indicated specification may not play normally or files or folder names may not display correctly. In this case, add the file extension “ .mp3” to the end of the file name, and then write it to the memory. This unit plays files with the file extension (wma) as a WMA file. Do not use the WMA file extension for files other than WMA files. Otherwise, it could result in noise or a malfunction. wma” to the end of the file name, and then write it to the memory. This unit plays files with the file extension (.aac*1/.m4a) as a AAC file. Do not use the AAC file extension for files other than AAC files. Otherwise, it could result in noise or a malfunction. *1 Type B Refer to Audio Set (Type B) on . aac*1” or “.m4a” to the end of the file name, and then write it to the memory. Refer to Audio Set (Type B) on . This unit supports playback of music files recorded to an iPod. • “iPod” is a registered trademark of Apple Inc. in the United States and other countries. • “iPod classic” is a registered trademark of Apple Inc. in the United States and other countries. • “iPod nano” is a registered trademark of Apple Inc. in the United States and other countries. • “iPod touch” is a registered trademark of Apple Inc. in the United States and other countries. • “iPhone” is a registered trademark of Apple Inc. in the United States and other countries. ●Remove the iPod when it is not in use. Because the iPod is not designed to withstand excessive changes in temperature inside the cabin, it could be damaged or the battery may deteriorate due to the excessive temperature or humidity inside the cabin if it is left in the vehicle. ● If data in the iPod is lost while it is connected to the unit, Mazda cannot guarantee recovery of any lost data. ● If the iPod battery is deteriorated, the iPod may not recharge and playback may not be possible when it is connected to the unit. Replace the iPod battery immediately. ● Be careful not to pinch the iPod connecting cable when opening/ closing the glove compartment. ● For the details on using the iPod, refer to the iPod instruction manual. ● When connecting the iPod to a USB port, all commands are made from the audio unit. Control on the iPod side is impossible. • This unit cannot display the images and video in an iPod. • The iPod functions on the iPod cannot be operated while it is connected to the USB port because the audio unit controls the iPod functions.